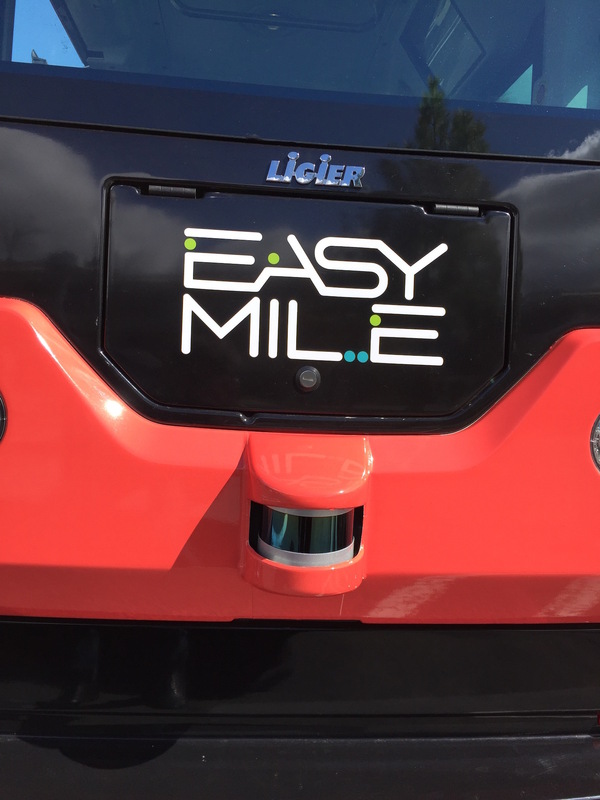 French manufacturer Easymile started today test operations of its autonomous shuttle buses EZ10 at the office park Bishop Ranch in San Ramon, 35 miles East of San Francisco. 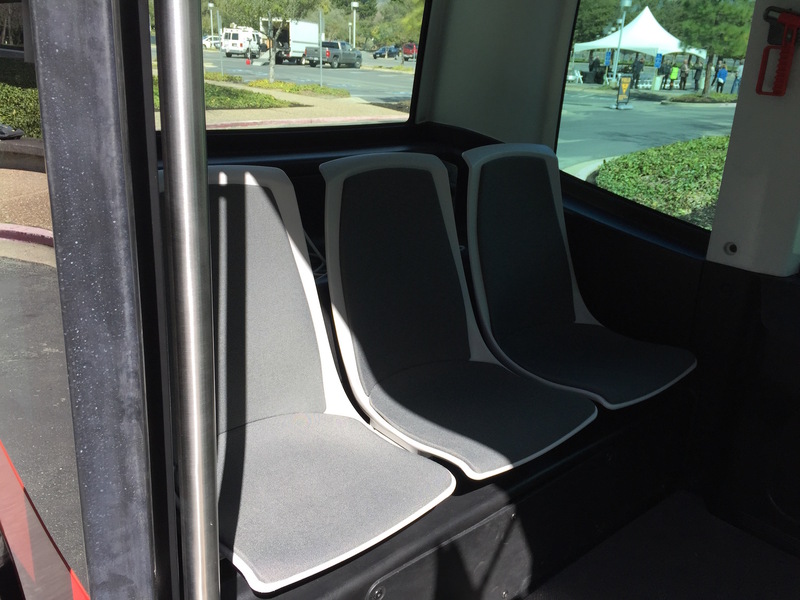 The driverless, electric buses offer seats for six and neither do they have steering wheels, nor pedals. 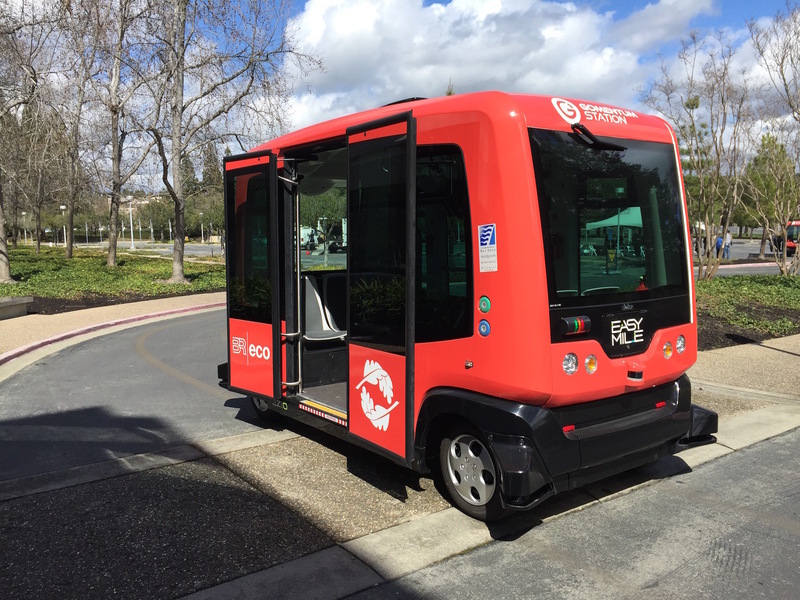 They are programmed to drive along pre-programmed routes and allow passengers to enter and leave them at predefined stations. 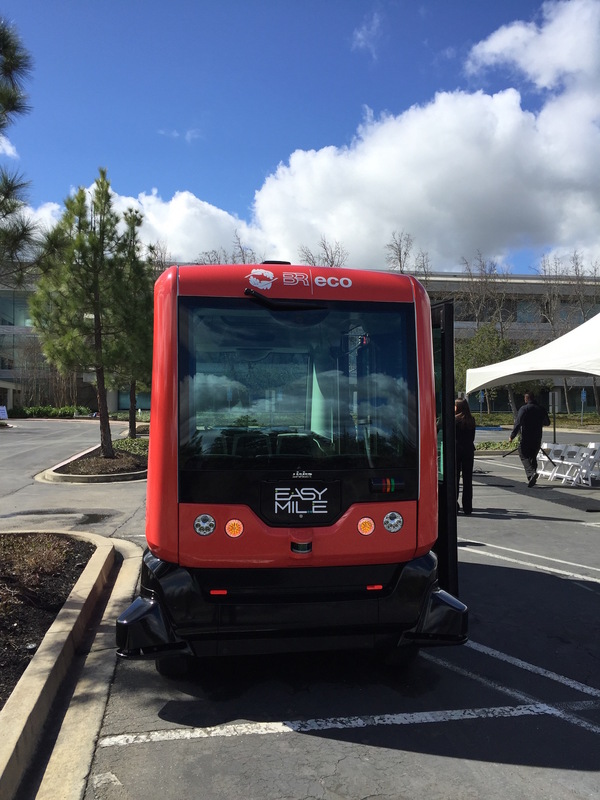 Two EZ10 vehicles were presented at today’s opening ceremony. 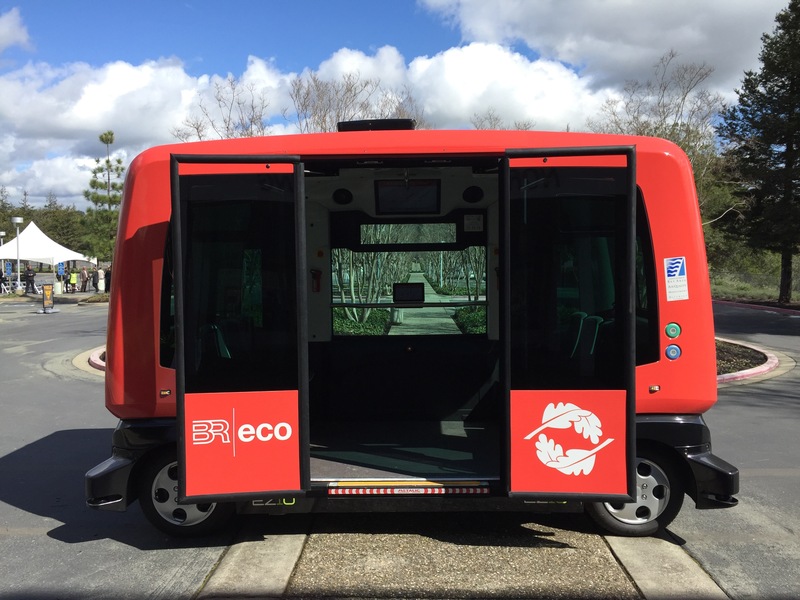 The buses themselves are manufactured bu the french car maker Ligier, and can take up to 12 people (six seated, 6 standing). The cruising speed is at 20km/h, maximum speed is at 40km/h. 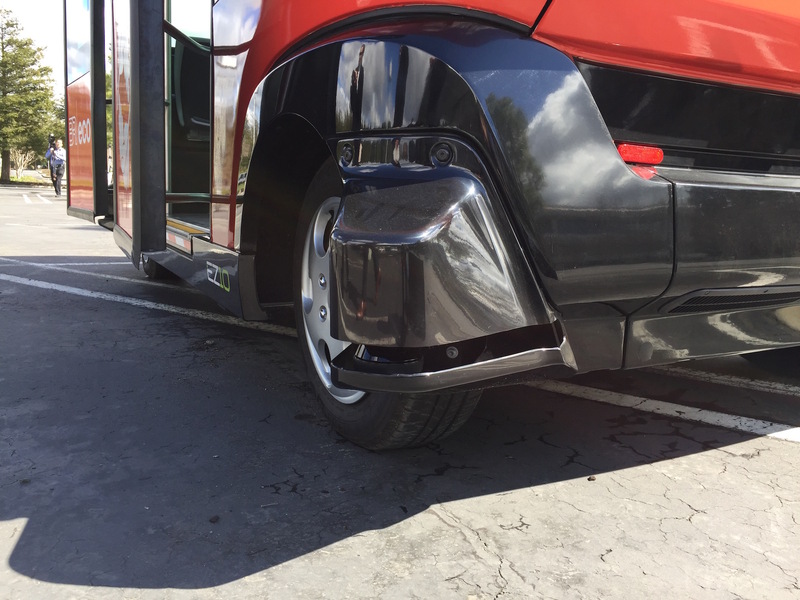 In total the bus weighs 1,050 kilogram, and can take on a load of up to 1,700 kilogram. The lithium-ion-battery drives up to 14 hours with charging stations with 203V / 16A. 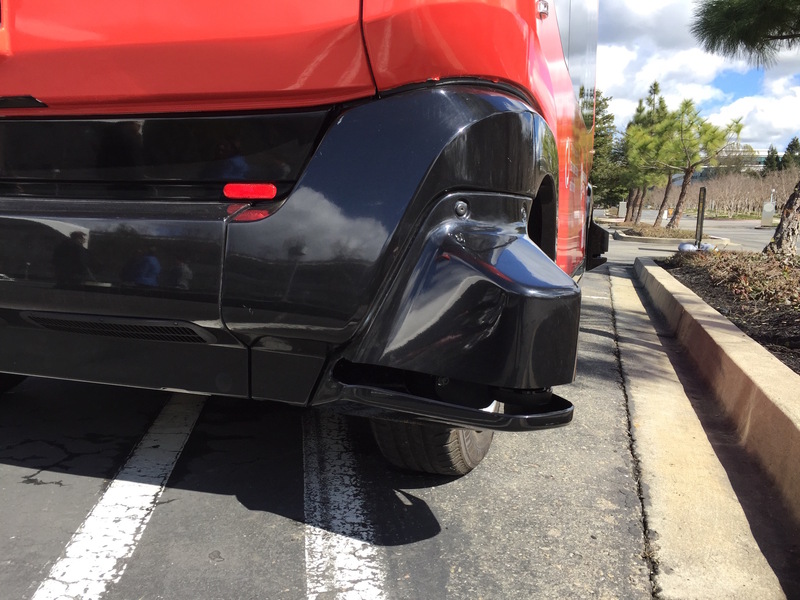 The bus can drive in both directions and doesn’t need to make a U-turn. 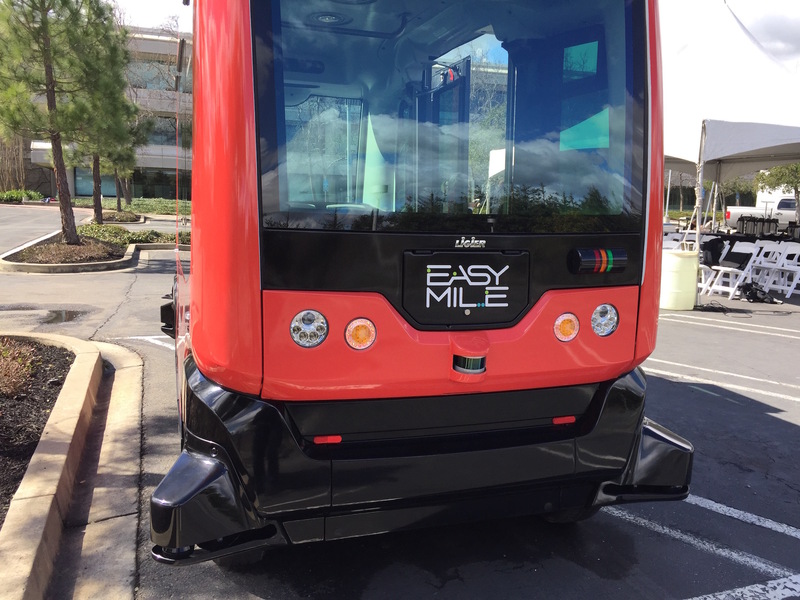 The buses can drive in three different modes: in the metro-modus in stops at every pre-programmed station. In the bus-mode it stops at each passenger request. This mode can be programmed to be a loop or a back-and-forth route. 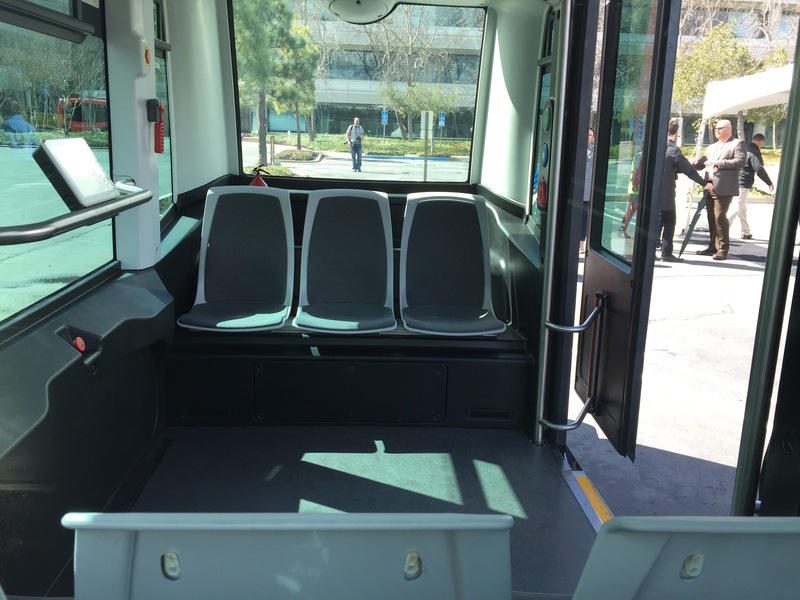 In the on-demand-mode the bus can be requested like a taxi via a smartphone-app. 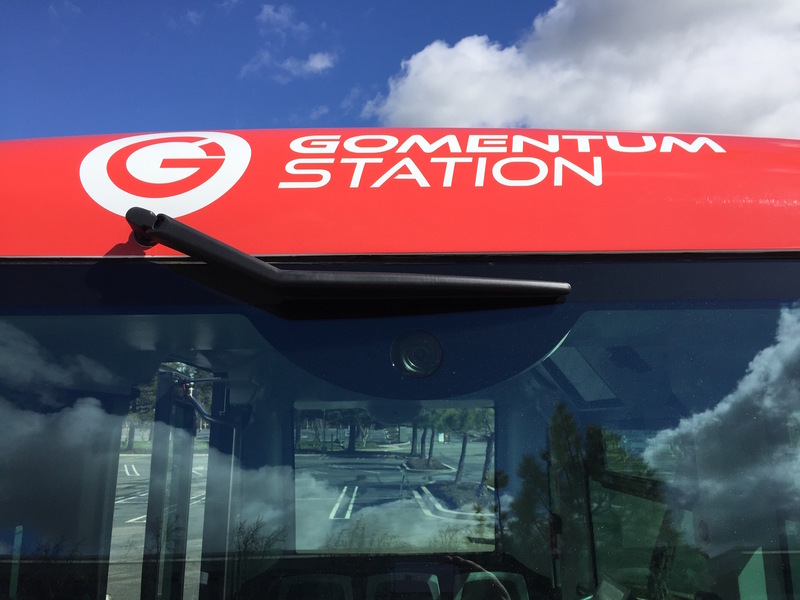 So far test drives have been done at the Gomentum Station test track. Bishop Ranch is the first public area, which even includes public streets. 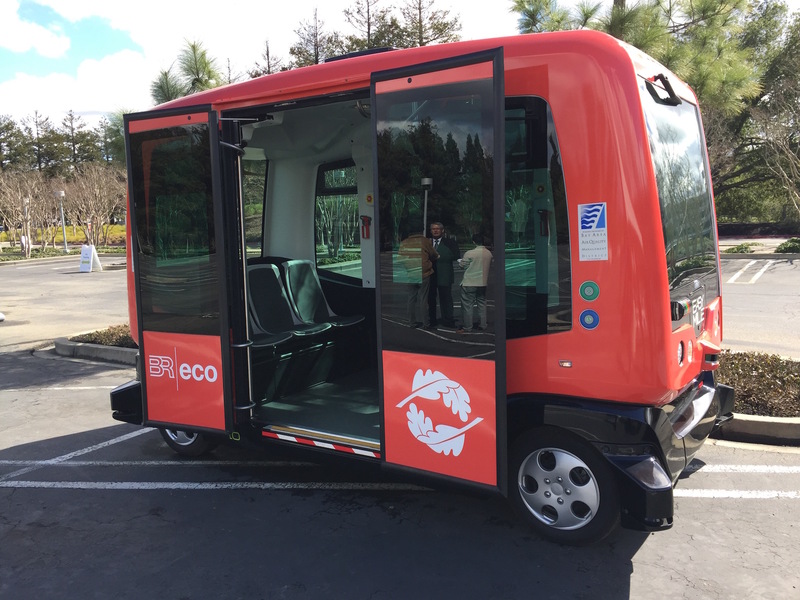 Specifically for this case governor Jerry Brown signed a law permitting the use of driverless cars without a driver present. Currently the vehicles are being used on a closed circuit in a test mode. 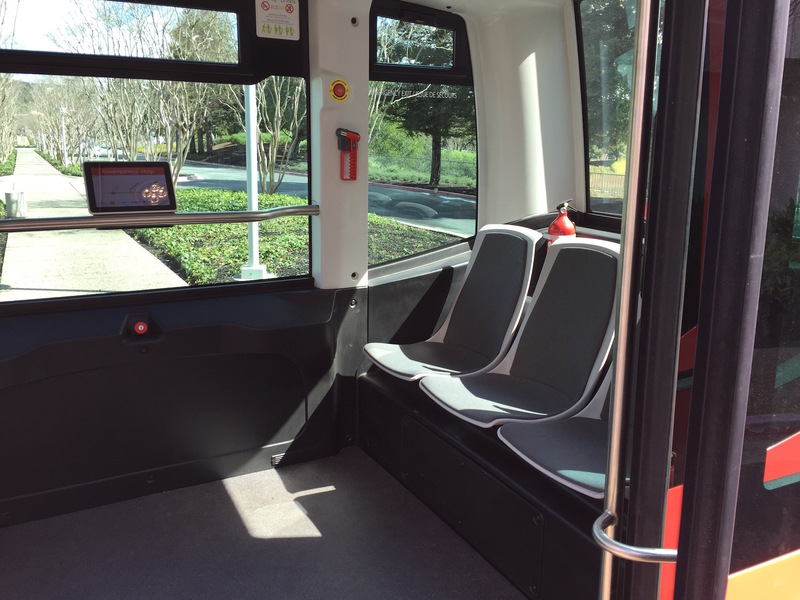 The inside of the vehicles shows the space, as well as the station display. 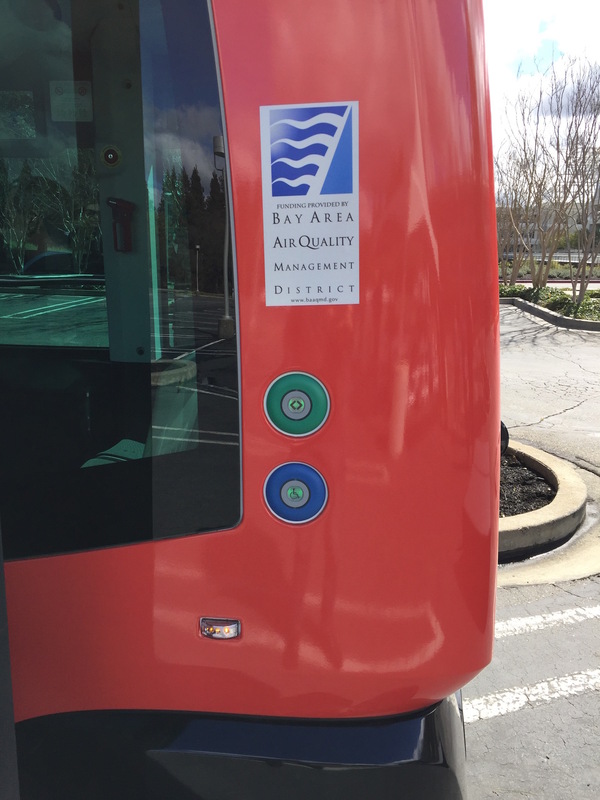 A big red button allows the emergency stop of the vehicle by passengers. 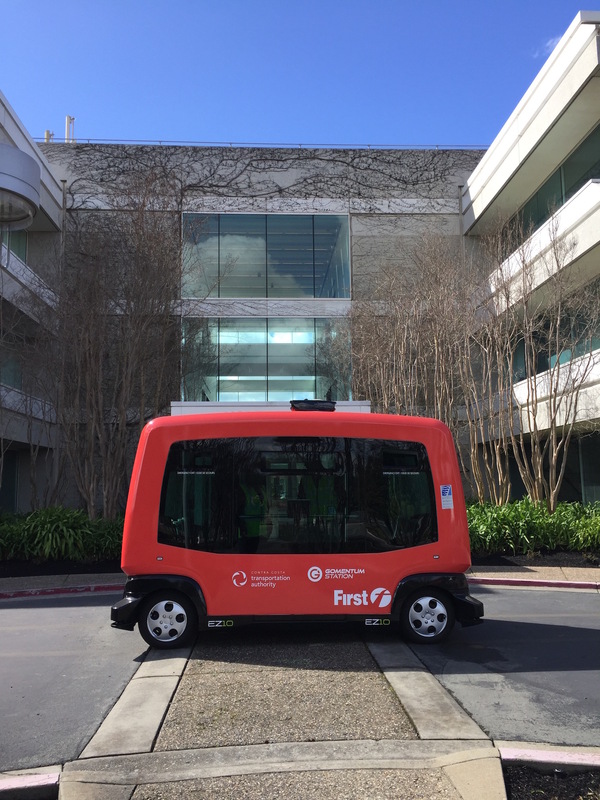 Other manufacturers of autonomous shuttles will also be coming to California. Navya, also based in France, just received a test license for California. 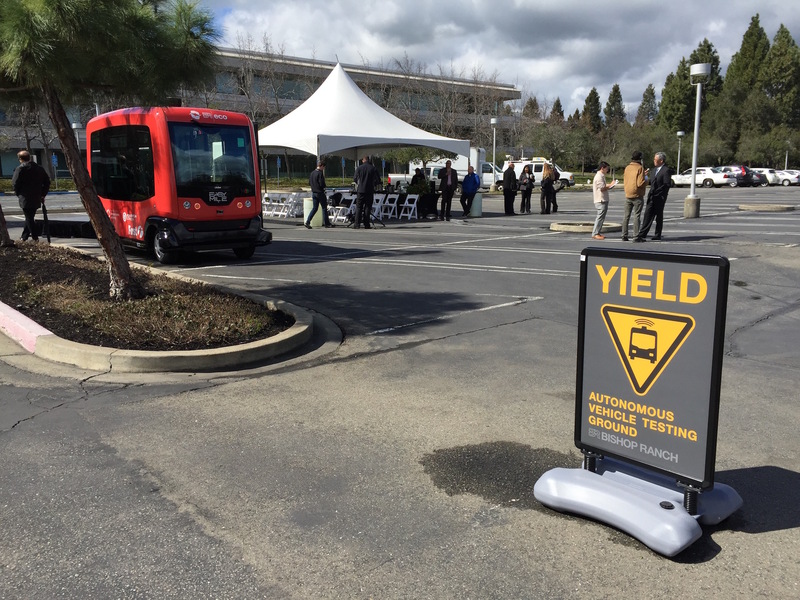 Each bus is equipped with cameras, lidars and sensors that form a virtual safety-chain around the vehicle. On each corner of the bus a sensors sticks out. 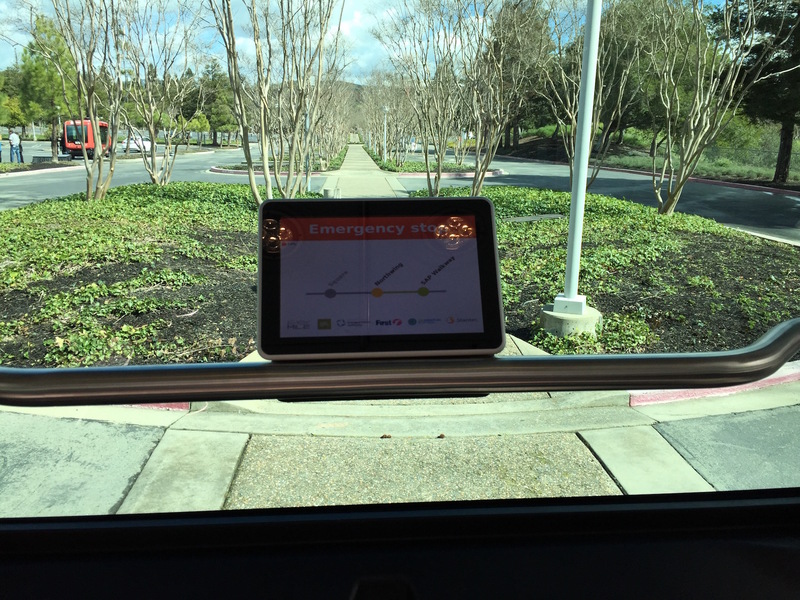 Every object that penetrates the invisible safety-chain between the sensors makes the bus stop immediately. 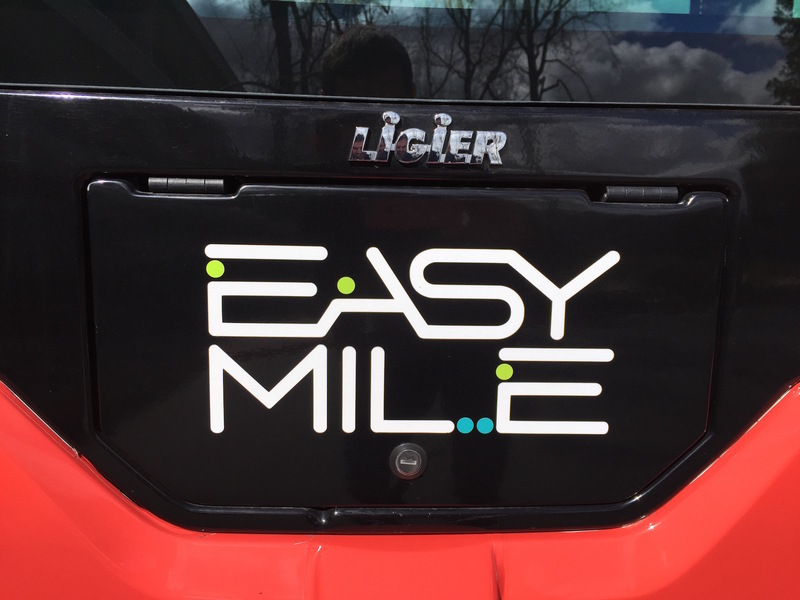 Here are more pictures from the two Easymile vehicles at Bishop Ranch.